All that said, I didn't want to let a pair of updates from Apple slip by without at least mentioning them. iOS 9.1, available for all devices that are capable of running iOS 7.0 and later, is a minor update to iOS 9 that adds 150 new cartoony emoji images. Anyone who has kids knows how important that is. (Ok, my wife and I send emojis - emojii? - to each other more often than we should.) Let's just get it out of the way now, the finger emoji is in this update. It's my wife's favorite. iOS 9.1 also has the "eye in a speech bubble" Ad Council anti-bullying campaign emoji. At lease we got the taco emoji. 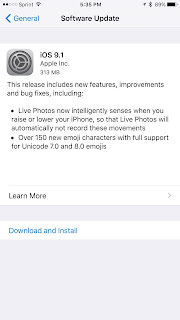 The other iOS 9.1 update is for the iPhone 6s and iPhone 6s Plus and the Live Photos feature. With iOS 9.1 on board, your new iPhone and detect when you are raising or lowering your phone to take a Live Photo and not include those images in the Live Photo image. It's a nice feature to have. When I was taking a few Live Photo shots, the early ones didn't come out so great unless I was holding my iPhone 6s Plus perfectly still while shooting them. With watchOS 2.0.1 Apple rolled out some minor but necessary updates for the Apple Watch. As you can see from the screen shot (above), all of the fixes address bugs that if not otherwise patched right way could leave to a poor customer experience. 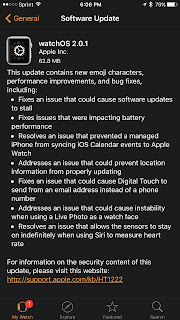 Both updates are available right now using the iOS Software Update feature for iOS devices and, for Apple Watch owners, via the Software Update feature in the iOS Watch app. 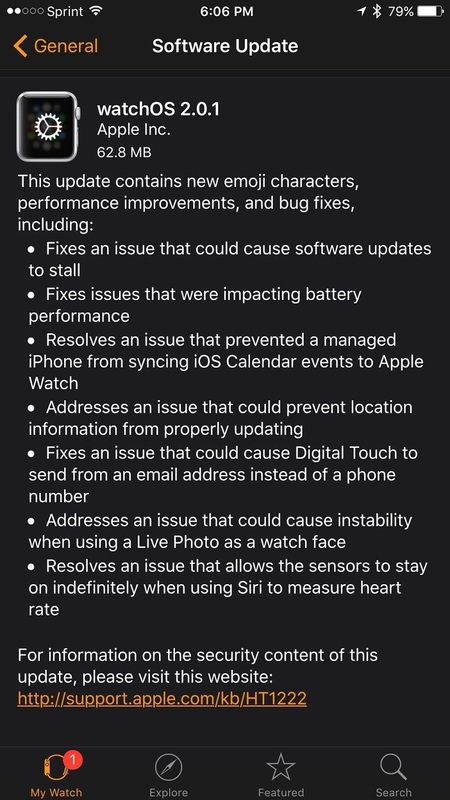 Both updates are recommended for iOS and Apple Watch owners.